The living room is kind of like the heart of a home. It’s where everyone gathers after a long day and entertains on the weekends and holidays. Deciding on a color palette for this space is rooted in how you want to feel when you are spending time in it. For many, they want something that is relaxing and family friendly. That makes blue a perfect option for many. Blue is one of my favorite colors to work with because it is so versatile. It’s gender-neutral and has an elegant, relaxing vibe that everyone naturally responds to. To take its versatility a step further, the hue and tone that you choose can say a lot. A deep, vibrant blue will be dramatic while a soft, subdued blue will be serene and tranquil. It’s all in the mood you want to capture. 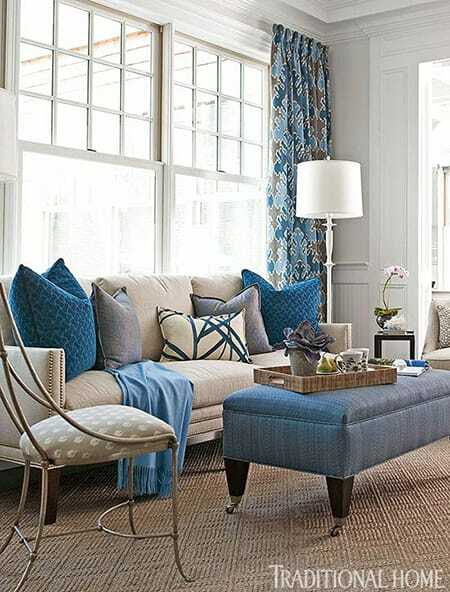 To show the incredible range of the color, here are several blue living room ideas that are all different but beautiful in their own way. 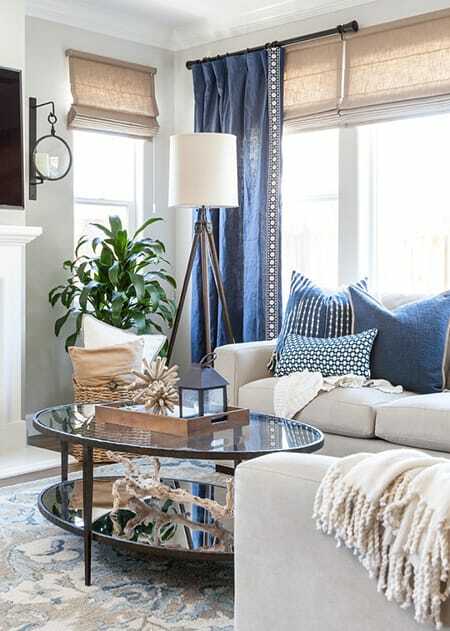 Blue accents paired with a neutral palette create a relaxing, elegant space for the family. 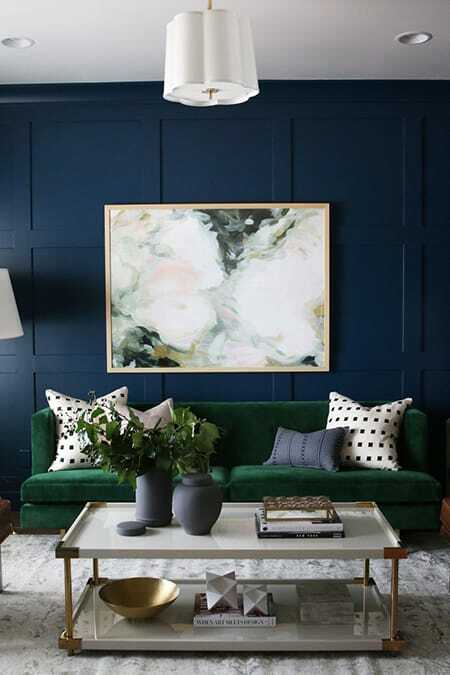 Navy blue creates a captivating pairing with the emerald green sofa. Nothing says coastal like blue. For an elegant approach to the style, keep things neutral with just a few coastal touches. Subdued grey-blue accents cultivate a modern appeal with a hint of color. 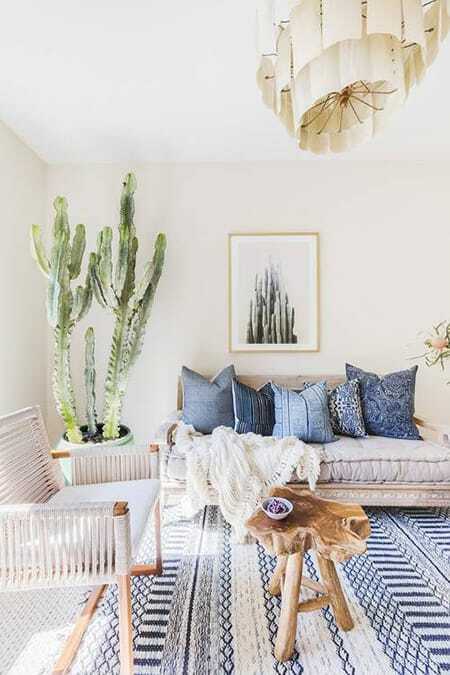 Blue serves up a casual, boho-chic vibe that is beautiful and refreshing. This room embodies traditional elegance with a lovely mixture of patterns on a clean white backdrop. 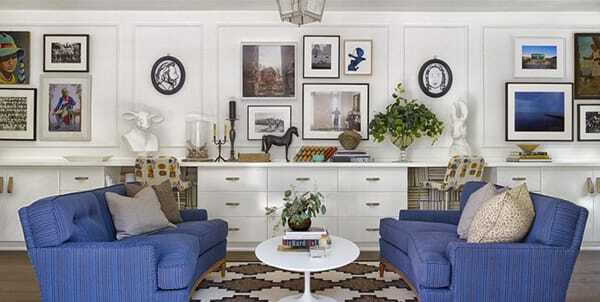 Deep pops of blue are dramatic and sophisticated in this white space. The blue and grey in this space almost have a monochromatic relationship with the blue acting as a more vibrant form of the grey. How stunning is that long Chesterfield sofa in a deep, vibrant blue? Definitely a statement piece! 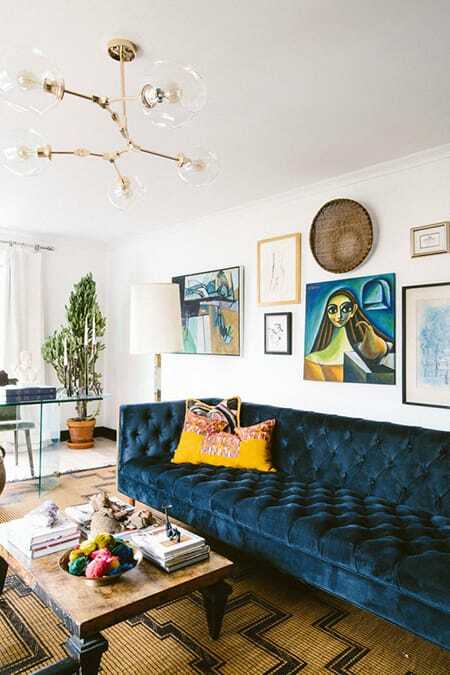 The art on the walls stands out on the white while the blue sofas add a splash of color that complements the artwork and pulls it all together. 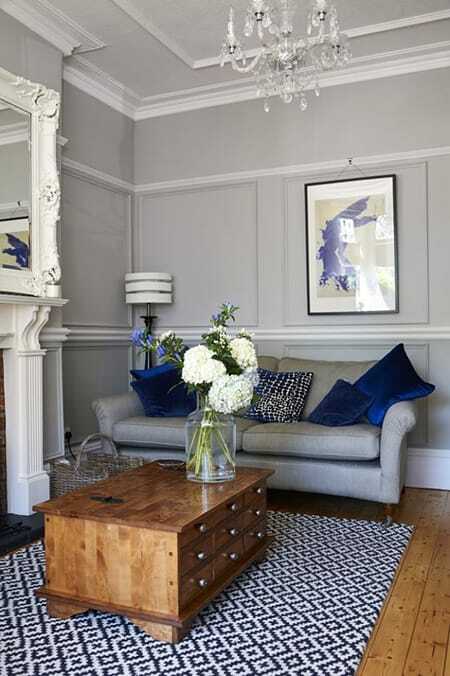 Blue is a beautiful choice for any room, especially the main living area.